All Cabin Kit Homes offer pre-built "panelized" packages... at no added cost! pre-built stairs (per model) and complete numbered "panelized" plans... for fast and easy installation. Pre-built "panelized" packages save time, labor and building costs. 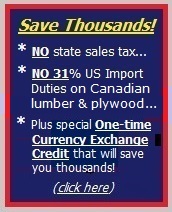 Local lumber company - Go to the "builder/contractor sales" department. Ask them for the names of two or three good builders. The lumber company always knows the good builders... because the "good" builders always pay their bills and are "good" customers of your local lumber company. Referrals - Ask neighbors or friends, or look for newly-built homes in your area. Any good licensed contractor who builds quality homes can help you, and always ask for a written quote. Local city or county building department - Building inspectors know the good builders. Ask for two or three names of good local builders who do their own work. See what the National Association of Home Builders says about "Panelized Building Systems." Builders and contractors use plans to figure out their labor costs. Without plans, builders cannot provide reliable bids or quotes. Labor Costs: Labor costs represent the time spent... hours, days, weeks, etc. Materials Costs: Materials costs represent the costs of the materials they provide. What happens if your builder provides the materials? Your Cabin Kit materials package includes the "panelized" pre-built walls and materials needed to build your complete locked-up weather-tight shell package. Under the "NAFTA" free trade program with Canada, the cost of materials is at least 31% lower than US prices. Plus, you pay no state sales tax... an added savings of at least 7% to 9%! In addition, you pay no builder mark-up of 15% to 20%. Even more important, you don't earn the currency exchange credit because of the stronger US dollar. Note: When your builder supplies the materials, he will charge you his higher US lumber costs... plus sales tax... plus his customary mark-up of 15% to 20%. Some builders don't like pre-built "panelized" packages because they don't get their profits and customary mark-ups on the lumber and plywood! Most builders, however, like having their customers supply the materials. Walls, roofing, windows, doors, siding, decks, hardware, etc. It's all included and there is nothing extra to buy. And you are provided with a complete written inventory of everything you ordered. It saves you time, labor costs, and unnecessary trips to the lumber store. And it gives both you and your builder a detailed, numbered list that avoids errors and mistakes. Note: Why do builders feel threatened when customers buy the materials? Because they can't add their customary 15% to 20% mark-up. It's smart to get more than one labor bid to make sure your new home or cabin gets built on budget, at the lowest cost possible. Tips about builders that can save you thousands! Tip: When the builder claims his materials cost less, ask him for a line-item copy of his materials bid. And then compare his bid to our written quote. Tip: Use your Cabin Kit plans to get "labor-only" line-item bids so that builders can't "front load" their costs. Keep control. And don't settle for "lump-sum" labor bids. Some builders suggest that pre-built "panelized" walls might not fit or work properly. Tip: However, the National Association of Home Builders says that pre-built "panelized" walls use higher quality kiln-dried materials that always fit, are factory built, structurally engineered, free from weather damage, pass US Customs and all building inspections, and save you thousands of dollars in higher labor costs. Don't be fooled by "low-ball" bids. "Low-ball" bids are dangerous. When a builder can't build for the price he quoted, you could be left with a half-completed home... including thousands of dollars in liens and un-paid bills. And regardless of your legal rights, the damages and recovery of lost money can take years to resolve. Tip: Enjoy the security and peace of mind that makes building your new home or cabin the thrill of a lifetime. Use your Cabin Kit plans to get written, line-item quotes that let you ask questions, get answers, and compare "apples with apples." Your banker will insist on line-item quotes, and so should you.